I have always thought winter wedding could be so pretty, even though they can be cold you can't beat the sun glistening off the snow. The icicles and the way nature is in the cold is just breath taking! To embrace this beauty can be expensive since you can easily get carried away. 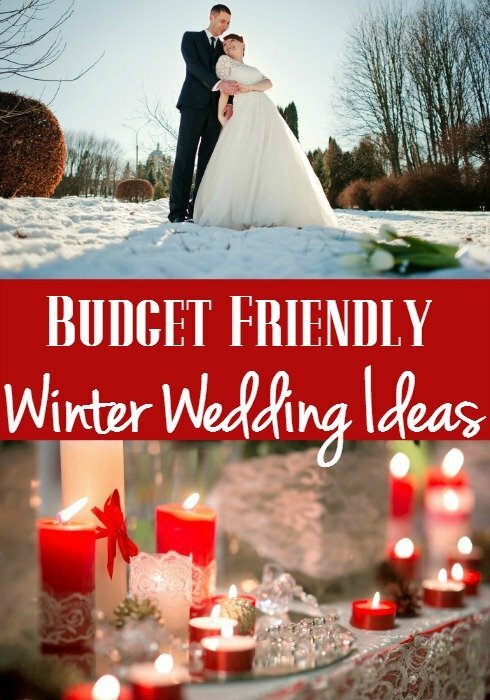 So I want to share with you some great ideas I have found for having the beautiful winter wedding of your dreams…. on a budget! Remember use light to your advantage it glistening off the snow. Heighten it with glitter in your decor and you have a win win! 1.Have a Hot Chocolate Bar – instead of expensive alcohol do hot chocolate to warm everyone up instead! 2. Give Everything a Frost – Use free nature items like pinecones and give them a frost touch with some spray paint and pick up some glass jars you can normally find at the dollar store and BOOM! Hot centerpiece! 3. DIY Pinecone Fire Starters – You can grab a ton of pinecones for free outside and then make your own wedding favors by turning them into fire starts for your wedding guest to keep warm! 4. Bejeweled Pinecones – Add some bling to your wedding with some bejeweled pinecones that you can DIY! 5. DIY Pinecone Seating Card Holders – Another great DIY you can do this to the bejeweled ones above too! 6. DIY Burlap Ring Pillow – Make your own ring pillow from burlap for only $10! 7. DIY Doily String Lights – Make your own string lights look how romantic they look lit up! 8. Sparkeling Fruit – Grab the fruit at the Dollar Store and spray it with Glitter Blast spray paint. 9. Go Christmas-y – Remember the biggest holiday in winter is Christmas so use it to your advantage! 10. Simple Center Pieces – Use Nature like branches and simple like lights. Take it a step further and spray paint the branches. All the nature items can be obtained free! 11. Ditch the Flowers – Flowers can really add up in the budget! Instead of using them in your decor use fruit. You can normally find packs of the fake ones at the dollar store! 12. Go Natural – You can find wood pretty cheap and use it around your wedding for decor and statement pieces. Again play off the lights.